Anthony was laid out around 1881, when the Atchison, Topeka and Santa Fe Railway was extended to that point. Anthony is located at (31.994626, -106.597612). According to the United States Census Bureau, the town has a total area of 6.5 square miles (17 km2), of which 6.5 square miles (17 km2) is land and 0.04 square miles (0.10 km2) (0.31%) is water. Anthony, New Mexico, in Doña Ana County, New Mexico, borders Anthony, Texas, to the north. 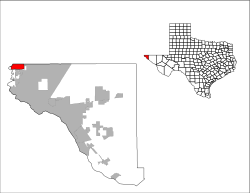 They are often considered twin cities, though Anthony, New Mexico, became incorporated on July 1, 2010 As a City, currently having Diana Murillo-Trujillo as Mayor. As of the census of 2000, there were 3,850 people, 684 households, and 577 families residing in the town. The population density was 592.5 people per square mile (228.7/km²). There were 722 housing units at an average density of 111.1 per square mile (42.9/km²). The racial makeup of the town was 77.79% White, 3.87% African American, 1.32% Native American, 0.21% Asian, 0.03% Pacific Islander, Hispanic or Latino of any race were 82.78% of the population. There were 684 households out of which 50.1% had children under the age of 18 living with them, 64.2% were married couples living together, 15.6% had a female householder with no husband present, and 15.5% were non-families. 14.8% of all households were made up of individuals and 9.2% had someone living alone who was 65 years of age or older. The average household size was 3.47 and the average family size was 3.84. In the town, the population was spread out with 20.7% under the age of 18, 12.7% from 18 to 24, 41.9% from 25 to 44, 18.1% from 45 to 64, and 6.6% who were 65 years of age or older. The median age was 32 years. For every 100 females there were 212.0 males. For every 100 females age 18 and over, there were 261.7 males. The median income for a household in the town was $26,295, and the median income for a family was $28,295. Males had a median income of $21,667 versus $17,273 for females. The per capita income for the town was $11,568. About 22.7% of families and 25.9% of the population were below the poverty line, including 34.4% of those under age 18 and 29.6% of those age 65 or over. Anthony has approximately 23 acres (93,000 m2) of developed parks along with approximately 45 acres (180,000 m2) of undeveloped park land. The Town of Anthony secured a large Texas Parks and Wildlife Department grant (approx: $780,000) in early 2007 to increase the size of Henry Miramontes Park. Projected improvements include an additional baseball field, parking area, jogging paths, nature walks, a skate park, and much more. A large section of bare desert land on the north side of Antonio Street near the 1400–1600 block is designated to become a soccer field complex with at least 4 fields and home to the Anthony Desert Rats soccer team. The team has yet to be formed and organized. An artist's rendition can be seen posted on the town's web site. The park land is currently divided into three parks. All parks are closed from 10:00 PM to 6:00 AM. The baseball park is named after Anthony Police Department's only officer killed in the line of duty. It is located on the east side of Richard White Street north of Franklin Street and south of State Line Road. The park consists of two fenced regulation baseball fields with bleachers and a small building used for maintenance and concessions. It is the baseball field used by the Anthony High School Baseball Team during the official baseball season. This park is named after a resident who was killed during the Vietnam War. It is located on the west side of Richard White Street north of Franklin Street and south of State Line Road. Most of the park is open and grassy with a few shade trees and benches. The northeast section is fenced in with a dirt road which can be used during open hours to drive in and park. Inside the fenced area is grassy with a few large shade covered slabs of concrete, a large open air basketball court, and a small public restroom building. Citizens can use the slabs to set up tables and grills for large parties (by permit only when purchased at the Town Hall). The fenced in section of the park is often rented by citizens and organizations to host large events such as car shows, birthday parties, family reunions, and company outings. In the middle of the park is a small stone monument with a metal plaque dedicated to the memory of Henry Miramontes. Anthony Park is located on a triangle-shaped island created by Antonio Street, Franklin Street, and 11th Street. It is sometimes called Triangle Park by local residents. This grass-covered park has several shade trees, covered picnic tables, and various sets of playground equipment. During the winter months the trees are decorated with lights. At the east end of the park where Antonio Street and Franklin Street intersect there is a flag pole beside a large metal sign which reads "Welcome to Anthony" in red letters facing to the east towards Interstate 10. Within the municipal boundaries of the town along the Rio Grande on the eastern side is a paved pathway with occasional benches and bridges for public use by bicyclists, joggers, walkers, fishers, bird watchers, runners, and other outdoor enthusiasts. The path lies between the river and levee. The path can be accessed under the Vinton bridge and ends at the New Mexico/Texas state line. The path is closed to all forms of motorized travel, including ATVs. The area within the levees and the levees themselves are administered by the U.S. Section of the International Boundary and Water Commission (USIBWC). The levee is not part of the public use portion of the path, and persons found on the levee can be charged with trespassing. Fishing is allowed from the bank with a Texas Parks and Wildlife Department-issued fishing license. The use of firearms is prohibited by Anthony municipal code, so hunting is not permitted. Every leap year Anthony, Texas, and Anthony, New Mexico, celebrate with an officially sponsored leap year birthday parade and festival. In 1988 local resident Mary Ann Brown, a member of the Anthony Chamber of Commerce and born on leap year day, February 29, proposed that the Anthony Chamber of Commerce host a festival centered on Leap Day. In February 1988 based on this celebration and because no other place in the world regularly sponsors such an event, the town’s Chamber of Commerce voted to sponsor Ms. Brown's idea of the festival and subsequently declared Anthony, Texas & Anthony, New Mexico to be the joint Leap Year Capitals of the World. New Mexico Governor Garrey Carruthers and Texas Governor Bill Clements joined in the special proclamation. United States Senator Pete Domenici of New Mexico entered into the Congressional Record of the United States a request that Congress and the President join in the proclamation. Senator Domenici read it into the Congressional Record Vol. 134, No. 146, Friday, October 14, 1988, of the 100th Congress. In January 1996 the Anthony, New Mexico, post office was designated "Leap Year Station" and granted a commemorative postal cancellation. In celebration of the event, the town's postmaster will typically appear as "Leap Year William" and distribute candy to parade attendees. The festival and parade is chaired by the mayor of Anthony, Texas. Membership for the Leap Year Birthday Club has grown from zero in 1988 to nearly 300 in 1996 and more than 400 members in 2003. Members include individuals from as far away as Europe and have traveled to Anthony to celebrate. Interstate 10 runs north/south through the municipal jurisdiction of Anthony and is the major route to and from the town. Texas State Highway 20 runs parallel with I-10. TX 20 along the La Tuna Federal Correctional Institution and south of it is designated Doniphan Street. North of La Tuna Federal Correctional Institution it is designated Main Street. Washington Street marks the division between North Main Street and South Main Street. North and South Desert Boulevards are frontage roads to I-10. They are one-way roadways that run parallel to I-10 along each side. FM 1905 begins at I-10 and runs west into New Mexico. From east to west, FM 1905 is designated as Antonio Street, then Franklin Street to South Main (TX 20). It continues west from South Main as West Washington to the New Mexico border. Texas State Highway Spur 6 (designated as Wildcat Drive, renamed from Oak Street) connects Antonio Street near the I-10 East on/off ramp to TX 20. Washington Street runs through the center of town. Main Street marks the division between East Washington Street and West Washington Street. The El Paso Gun Club shooting range is located in the northeast corner of the municipal limits of Anthony. An unpaved road at the end of North Desert Blvd allows access to the gated entrance. Membership to the club is required for range use. Anthony Municipal Code has established a curfew for anyone under the age of 17 between the hours of 10:00 PM and 7:00 AM unless accompanied by a parent, guardian, or family member over the age of 17. Anthony, Texas Facts for Kids. Kiddle Encyclopedia.